At ten years old, Luca has spent a lifetime in and out of the RCH, starting from the day he was born. After a traumatic birth, and the loss of his twin brother, Luca was diagnosed with severe hearing loss and had to rely on a feeding tube for his first years of life. The following years would continue to throw challenges at Luca including an autism diagnosis, yet the active, engaging little boy has taken it all in his stride. Click here to donate today and support children like Luca. We’re proud to introduce four-year-old Ollie as the face of the 2019 Good Friday Appeal! Ollie was diagnosed with Fibular Hemimelia during gestation, a rare condition that occurs once in every forty thousand births. The latest RCH National Child Health Poll revealed 71% of Australian children do not walk or ride to school in a typical week and one in five teenagers never travel to or from school without an adult. Kids Health Info is dedicated to providing quality, up-to-date paediatric health information that you can depend on. Over 300 factsheets on topics that are important to you and your child, it’s free and available 24-hours a day, when and where you need it. Our Paediatric Injectable Guidelines have been compiled by clinicians, for clinicians, to assist in the safe administration of injectable medicines in children. Click here to learn more, or to buy an online subscription or printed copy of the guidelines. The RCH offers specialist care to international patients that can give children and adolescents the chance at a healthy life. Click here to read about our International Patient Program. Sign up now to connect with information in your RCH medical record, when and where it suits you. Travel a long way to get to the RCH? The RCH offers telehealth video-consultation for families from rural and regional Victoria or interstate. Usually, this is for known patients for follow-up appointments. This can be in your home or with your local doctor. The app is an interactive guide to help you know what to expect during your stay, and navigate the RCH world. Click here to learn more and download. 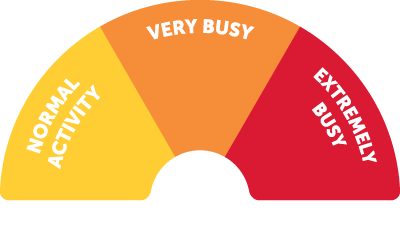 View the Emergency Department status page for a real time guide to how busy we are. We are the major specialist paediatric hospital in Victoria and our care extends to children from Tasmania, southern New South Wales and other states around Australia and overseas. It’s been another record-breaking Good Friday Appeal, raising an outstanding $18,175,467 for The Royal Children’s Hospital! All eyes are on baby Kit McClymont, as his parents pour all their strength into his recovery as they rewrite their story of heartbreak. Parents Sammy and Nathan lost Kit's twin brother Noah after his first week of life. This year the 11th National Bioethics Conference will explore these challenges and the impact they have on healthcare – under the title ‘Respecting different perspectives’.We are now inviting submissions of abstracts for oral presentations - standard papers or de-identified case studies. Siblings Harriet and Franklin have both been patients at the RCH after experiencing very different emergencies. Nine month old Harriet gave her parents a scare this month after she suffered from a 90-minute long seizure while older brother, Franklin went into heart failure only weeks after birth. Max has received the gift of life twice from his mum. After his mum Kylee was told Max would one day need a kidney transplant following a diagnosis at birth, she decided to donate her own, strengthening the bond she already had with her son. Baby Boet received life-saving jet therapy treatment at the RCH after being born at only 25 weeks gestation. Today is his original due date and his family are now counting down to taking their son home for the first time. We're proud to welcome four-year-old Ollie as the face of the 2019 Good Friday Appeal. Today we hear from Dr Sarah McNab, a paediatrician, a parent and the first woman at The Royal Children's Hospital to be named Director of General Medicine. Cystic fibrosis patient Jaymee tells us how she likes to empower women in her everyday life and the advice she would give to other young women who are struggling with medical conditions like CF. Bec from our Transition Support team has been on both sides at the RCH, having had a heart transplant here over 15 years ago and now working with patients transitioning into the adult health care system. Bec takes us through her story and how her mother is one of her biggest inspirations. Your support will help fund essential treatment and care across the hospital. Giving in honour of your RCH caregiver is a meaningful way to support the hospital.